The bicycles for my girlfriend and me came with Continental X-King 2.2 tires. These are high quality mountain bike tires and also quite light for their size (2.2 is the width in inches, which is about 56 mm) but after taking them for a ride I did not like them at all. The tires have knobs on them for extra grip in the mud, but on the road this causes extra rolling resistance, but even more annoying is that when cornering you can hear and feel the knobs on the road. I was not terribly impressed with the grip either, at the first patch of sand I was able to slip with them just as any other tire would. It may be better on some muddy trails, but that is not where I will be 99% of the time. When I first started thinking about getting a new bicycle I thought I would get completely slick tires like the Schwalbe Kojak. The thread pattern doesn't actually do much for bicycle tires anyway, so way not go all the way? However they are only available at 35 mm wide. This is more than enough for a city bicycle, but wider tires have some additional benefits: They provide the best suspension you can get on a bicycle, can carry more weight and have less rolling resistance. As I want to riding around with camping gear and other stuff over gravel roads some wide tires might be a good idea. After writing this article Schwalbe introduced the "Almotion" tire, which is meant for loaded touring on rough roads. This tire also available in widths up to 55 mm, and carries a hefty price tag. After some deliberation I eventually opted for some Schwalbe Big Apples. They come in widths from 50 to 60 mm. The ones I got are 50 mm wide, but on the narrow rims that I have it is more like 46 mm when inflated at the low end (2.5 bar) and closer to 50 mm when inflated at a higher pressure. They have some thread pattern in them, but it is minimal, just enough for people to feel good about having some thread on there. The Big Apple are mostly marketed towards city use and are often found on "Mommy bikes" and cargo bicycles with crates on them, as they are comfortable and can carry more weight at lower pressure. According to Schwalbe wider tires have less rolling resistance, provided you pump them up hard enough. One nice aspect is that they are so wide that they can never get stuck in tram tracks that some cities have, the downside of that is that they can be too wide for some mudguards and locks. However, they have one major disadvantage: weight. I did not realize this when I got them but at 740 grams each they are heavier than the tires they are replacing. Sure they make for a much smoother ride on the road but I am still not completely sure about them. But 740 grams is not that bad, if you look at some of the other options. 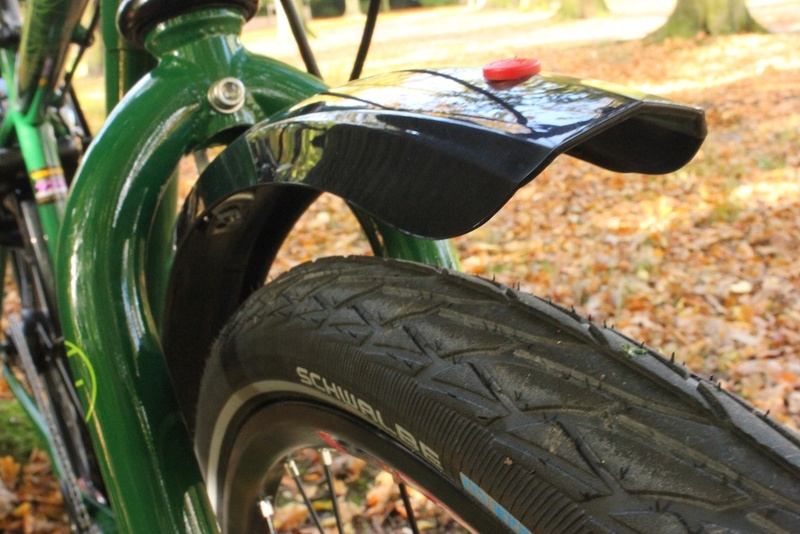 Schwalbe makes Big Apples out of different kinds of rubber. Mine are from the Performance line, but there is also the Active line which is worse in every respect. The tires weigh 930 grams each and are rated lower on speed, grip, puncture protection and service life. The only thing better is the lower price. 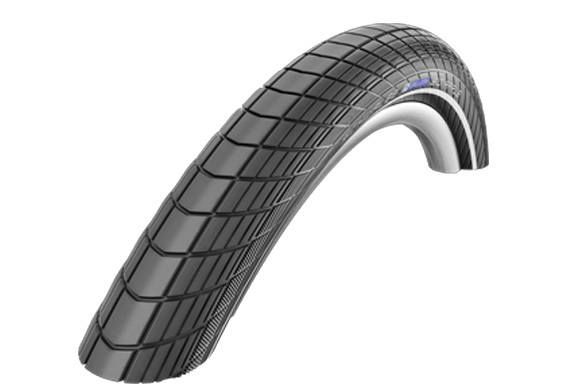 Schwalbe makes even heavier version; the Big Apple Plus. 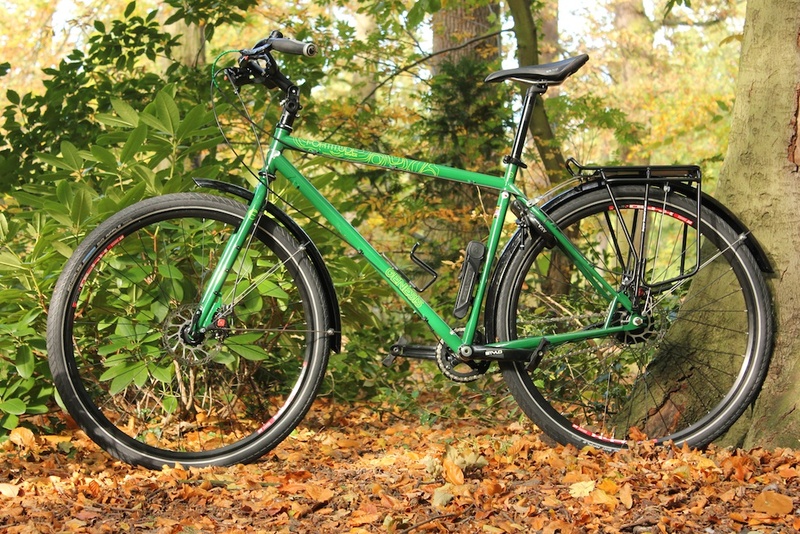 At 1100 grams you could carry an extra tire with you and still save weight. A slightly lighter alternative to the Big Apple is the Super Moto at 680 grams (60 mm). However the weight difference is rather small, while it has significantly less puncture protection. Even lighter is the Marathon Supreme with 645 grams (50 mm). It's rated higher for speed, grip and puncture protection. Unfortunately it will also make your wallet somewhat lighter as it is one of the most expensive bicycle tires you can find. Bicycle with Schwalbe Big Apple 50 mm tires installed. Close up shows reflective strip and thread of the tire. For Mimi's bicycle I got a pair of Schwalbe Marathon Racers. These are a little bit more expensive and are 40 mm wide but at just 495 grams weigh over 200 grams less for each tire. On the rim I measured them to be 38 mm wide. The regular Marathons are Schwalbe's puncture resistant tires, ideal for in the city and touring. 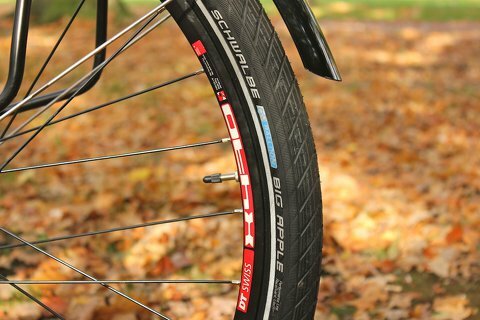 They are very popular, and Schwalbe has introduced a growing amount of variations of the Marathon tires. The downside of regular Marathons is that they are a little stiff and heavy because they are so thick. The Marathon Racers are the lightest Marathon tires, but also the least puncture proof. To make things even more complicated the Marathon Racers have two product lines, the Performance (regular) and Evolution line, with the latter being more expensive, lighter and having a little bit better puncture protection. However its made with "RoadStar" rubber compound, which as far as I can tell wears down quicker than the Performance tires that uses "SpeedGrip". So I chose the cheaper Performance tires, as they were already more expensive than the Big Apples. I didn't replace the inner tubes, fitting them in the 40 mm tires was a little bit more difficult, but it eventually fit, even though the markings said it should not. The spare tube I got should fit fine in both 40 and 50 mm tires (size number 19). 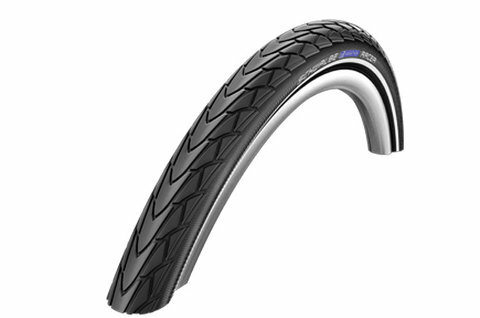 Both tires have Schwalbe's puncture protection level 4 called "RaceGuard". It's a scale that goes up to 7, the downside of more puncture resistant tires is that they are heavier and have more rolling resistance. I think this is a good compromise, but ultimately it's a matter of chance. So far both bicycles have done over 1500 kilometers through various countries without any punctures. Schwalbe Marathon Racer 40 mm tire on front wheel. The Marathon Racer has a bit of thread. Update April 2017: it has been almost three and a half year since I installed these two sets of tires. The Big Apples have been used more, and have had zero punctures so far. The thread has worn a little bit, but the wear is uniform and there are no damages. The tires are proving themselves to be very durable. At first I was pumping them up up to 4 bar. But since then I keep them more around the minimum recommend pressure of 2.5 bar for increased comfort. 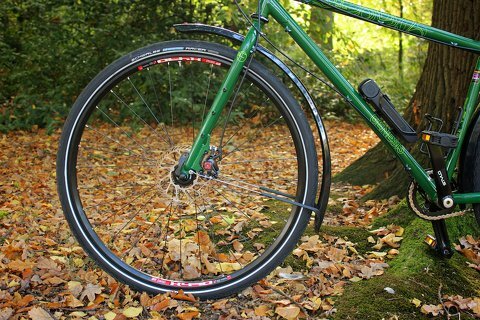 For loaded cycling trips I inflate the rear tire up to 3.0 bar. The Marathon Racers have been used a little less, the rear tire has suffered two punctures. One in 2015 in England where there was a big cut across which went deep into the rubber and then made a tiny puncture at the thin sidewall. 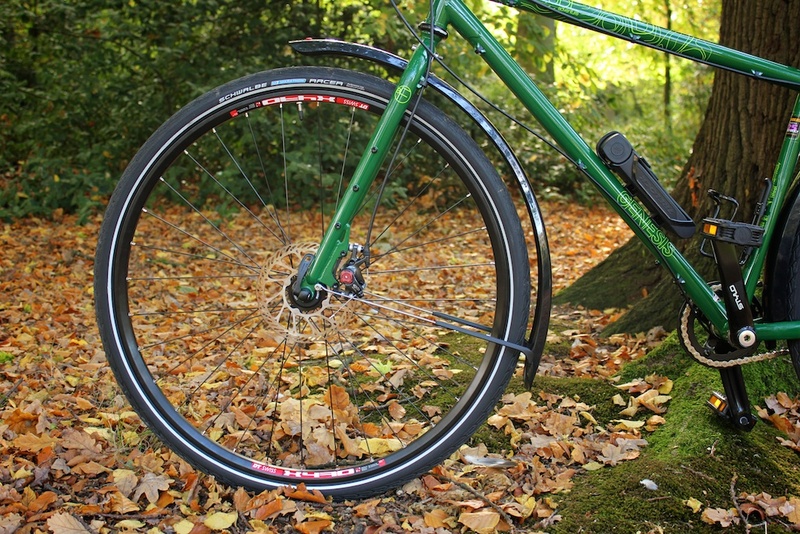 In 2016 the tire has another puncture when cycling through a forested area. The exact cause remains unknown, I suspect a thorn of some plant. In April 2017 I replaced the rear tire because there was damage to the sidewall and casing of the tire. The damage was relatively minor, but I did not want to risk it for an upcoming tour. The Marathon racer was replaced with the same tire. If I had replace the Big Apples I would have no problem getting the same tires again. The Marathon Supreme of the same size should perform better according to Schwalbe, and most importantly weighs 100 grams less, but costs about double the price, making the Big Apple still an appealing choice.